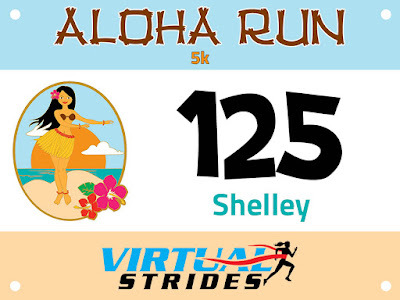 I don't do a lot of virtual runs/races, but sometimes the medal is just too appealing and I can't resist registering. Such was the case last year with the Beat the Blerch run, and then again this month, with the Aloha virtual run - you could register for either a 5K, 10K, or half marathon. Naturally I chose the 5K because I'm no fool - it's June, it's Texas, and it's H-O-T hot! The race is put on by Virtual Strides - they do one themed race each month, and every race has a charity beneficiary. This run benefited the Breast Cancer Fund. Saturday was the day for the run - Julia, Brian and I did it in town, while Cary and Cristy ran on the beach (lucky girls!). We started at 6:30 am, but the sun was already up and not only was it hot, we had that fireball in the sky to contend with as well. Somehow running in the dark makes the hot and humid weather not seem as bad...it might be a little bit of a mental thing, who knows. All I can tell you is that it was 75 degrees, felt way hotter, and the only breeze came when a big truck blew past us on the road. If there was any doubt, summer temperatures have arrived in Texas! My bib - I printed it out, but didn't run with it because it would have been ruined by sweat. Looks very nice hanging on my ring of race bibs...and it makes me want to go back to Hawaii right this instant! Brian was our lead runner - well, he and the dogs, Abby and Koda. They took off, rounded the corner, and that was the last Julia and I saw of them until we were finished...just like in a real race, LOL! She and I settled in for our run, which was enjoyable - we haven't had a chance to run together in a couple of months, so we had a lot to catch up on. I think the worst part was having the sun beating down on us - we will have to move our start time back to 6:00 am and get back to our vampire running (darkness suits us better). We ran a big square loop - honestly, the hardest part was having to run past where we'd parked to get the extra bit of mileage needed to make it a 5K. It's nice to run in familiar territory...not a lot of thinking required beyond putting one foot after the other. We have this shot where we're all looking at the camera and smiling, and about twelve shots of us bending down, trying to get Abby to sit and face the camera. We finally gave up so we could take the picture and go to breakfast. After the run, we headed to Blue Baker, where we had some good food (and a cinnamon twist, my favorite), great conversation, and as it turns out, fun tunes. Somehow the conversation evolved into music, and snippets of everything from mariachi music to 90s hip hop to Raffi (OK, that would be me - my explanation of why I was unfamiliar with the early 90s music...children) were played via iPhones. I love that you can mention a song and pretty much find it instantly and play it (in my head, you still have to wait for that song to come on the radio and hope you happen to be listening at the right time). As usual, it was another great morning spent with running friends! Definitely a great morning! What a fun thing to do a virtual race and that you get a medal too! And I love that the doggies are running with you guys too. Hmmmm, I should do virtual races - much more my "speed" than organized races right now. I might even be able to talk Mr. Helen into running one with me, once he can run again. I noticed that when I visited the website. 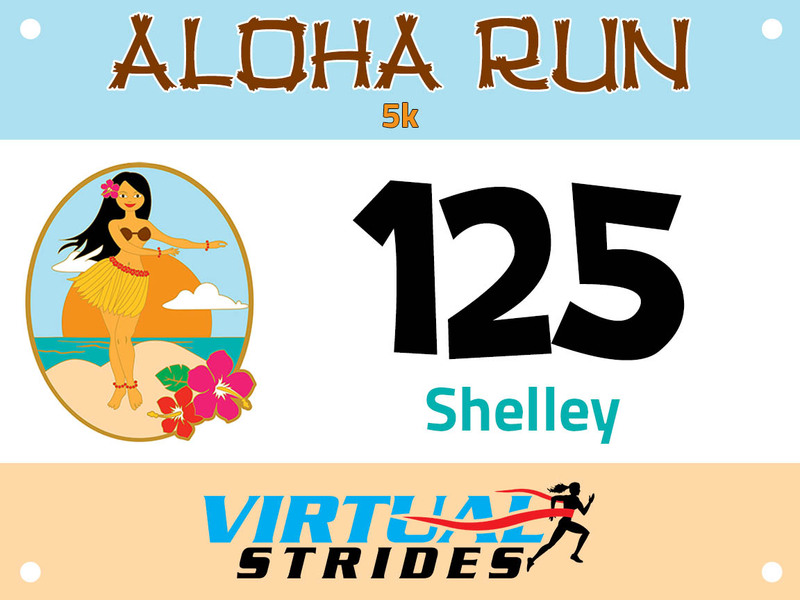 I really like that idea and now I'm trying to figure out if I can do the Aloha Race before time is up!! I might have to look into a virtual race myself. It would be walking because it is way too hilly in my town for me to try and run! Love that picture of you guys. I can FEEL the Texas heat just looking at it! I'll be honest, nothing beats the race day excitement of a 5K, but a virtual race is fun, especially if you can rope in some friends to do it together. 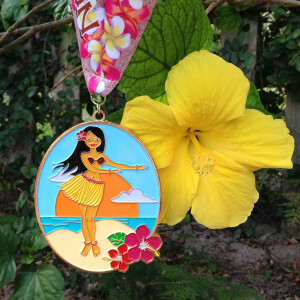 That medal is totally worth signing up for a virtual race! 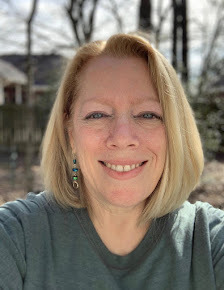 I'm registered for a virtual 5k as well, "Love the Skin You're In" (hosted by Brooke: Not on a Diet), and while the money is going to worthy cause, the medal sealed the deal! Good eye! They are fairly new - still the original Cliftons. The Clifton 2 has been released, but the tongue is padded now - not sure if I'll like that, but luckily I won't have to get new shoes for a while. With the current Clifton tongue (that sounds slightly dirty, lol), I don't have to relace my shoes to not cross over the funky high bone (again, dirty) on my left foot. I wonder, with the new padded tongues, if I'll have to make that change. I've never heard of virtual races. What a cool idea, especially since $$ goes to charity. I wonder if they do that for biking? Like you said in a previous post, it is hard to find a good match for exercise and I do most of my biking (walking too) alone. I like this idea because it would add some pizazz. Although my longest ride to date is 10 miles, so even if they do I might not be able to participate.